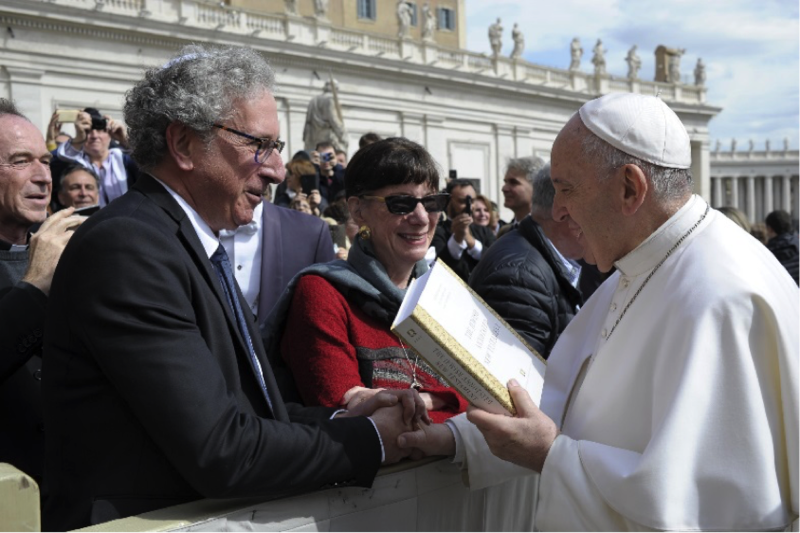 Amy-Jill Levine, Professor of New Testament and Jewish Studies at Vanderbilt University, and Marc Zvi Brettler, Professor in Judaic Studies at Duke University, the editors of the Jewish Annotated New Testament, presented the book to Pope Francis at the General Audience on Wednesday, March 27th. The following day, the work was discussed at a conference held at the Aula Magna of the Gregorian University, with responses by Professor Pino Di Luccio, S.J. and Biju Sebastian, S.J. 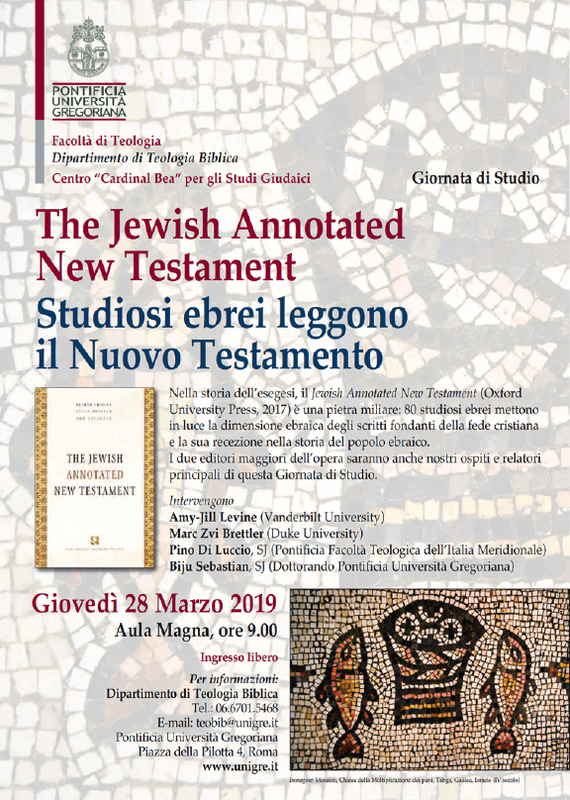 The event was organized by Professor Jean-Pierre Sonnet, S.J., and Professor Luca Mazzinghi and co-sponsored by the Gregorian’s Faculty of Theology and the Cardinal Bea Centre for Judaic Studies. The Jewish Annotated New Testament involves contributions of seventy Jewish scholars. It is the first major attempt of Jewish scholars to make the New Testament accessible to a Jewish readership, especially as an important source for the history of Judaism in the first century. At the same time, this work opens a Jewish perspective on the New Testament to Christian readers. It helps Christians to become aware of passages that are problematic for Jews. It also helps one to appreciate the implications of the Jewish identity of Jesus and the first believers in Christ. This work opens the door to respectful and enriching dialogue and is thus a major contribution to Jewish-Christian relations. and Dominik Markl, S.J. (left). Amy-Jill Levine is currently Visiting Professor at the Pontifical Biblical Institute (PBI), where she teaches a course on the Parables of Jesus. She is the first Jewish scholar to teach in the field of New Testament at the Institute. She will also deliver a paper at the conference Jesus and the Pharisees, 7-9 May 2019, organised by Professor Joseph Sievers (PBI). Marc Brettler presented a lecture on “Religious and Critical Perspectives in Jewish Biblical Studies” at the PBI, hosted by Professor Agustinus Gianto, S.J., of the Institute’s Oriental Faculty.